Much like the rest of Major League Baseball, the Colorado Rockies have had an offseason of little movement, accentuated by their singular acquisition of Daniel Murphy. With their limited funds given the impending free agency of franchise cornerstone Nolan Arenado and the freeze amongst free agency, there are limited moves left to be made for the club. Last season, the Rockies trotted out a lineup that had differed results almost regularly. On one hand, the club endured massive slumps amongst the entire team, scoring two or fewer runs in 41 respective games, just north of one-quarter of the season’s 162. In 36 other games, the team scored a whopping seven runs or more, highlighted by the batting order’s 19-run explosion against the Arizona Diamondbacks in mid-July. With a heavy reliance on home runs, the team faltered often in games where the ball stayed inside the friendly confines of each respective ballpark. In all, the Rockies accumulated 780 runs on the year, good for 4.78 per game, second in the National League. The boon for the club came at home where they scored 445 of those runs, not surprisingly, compared to 335 on the road. Overall, it was an average effort for the Blake Street batters. As of right now, the lineup will remain largely the same as last year, sans a couple Rockies mainstays. D.J. LeMahieu, Carlos Gonzalez and Gerardo Parra are all currently free agents, leaving holes in their wake. Being relied upon to replace the trio’s 213 runs is a group of youngsters. Garrett Hampson, Raimel Tapia and David Dahl are the likely replacements for the Rockies’ departures. The three homegrown hitters have yet to play for another club, with each adding to a total of 795 plate appearances amongst them. With their replacements in place and Murphy set up to take hold of the first base job, moving Ian Desmond to a utility role, the Rockies lineup would project as a slight downgrade. It is likely that Charlie Blackmon will continue his reign atop the lineup, with a combination of Nolan Arenado, Daniel Murphy, Trevor Story and Dahl behind him. For the final four spots, the Rockies would put forth the efforts of their catcher (currently Chris Iannetta or Tony Wolters), their remaining outfielder (likely Tapia), Hampson and their starting pitcher. As far as projecting their lineup against last year’s, the Rockies would have greater speed from the inclusion of Hampson and Tapia, likely similar or better on-base numbers from Desmond being replaced by Murphy and an influx of youth. The downside for their lineup is a subtraction of power and experience. Tapia, Dahl and Hampson all bring speed to the Rockies lineup, with Dahl being the main power threat (162 game average of 27 home runs). The three are also all under 25 years old, with growing pains to come. The franchise would be wise to continue seeking upgrades for their lineup as insurance in case the young fielders don’t pan out. Costly additions are not a need, but acquiring more talent would be safer than relying on inexperienced hitters for a team looking to push past their early exits in the postseason the last two years. If there was a bright spot that burned intensely for the club last year, it was the prospects of their rotation in the future. 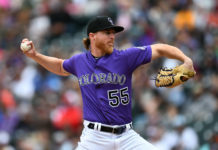 Headlined by Kyle Freeland and German Marquez, with the formerly projected ace of the staff, Jon Gray, in tow, the rotation has the talent to be special. Last year, the aforementioned tandem of Freeland and Marquez combined to hurl 398.1 innings, winning 31 games in the process. The former collected a team-high 202.1 innings en route to a 2.85 earned run average and 164 park-adjusted ERA, good for a fourth-place finish in NL Cy Young voting. All of that in just the lefty’s second year in the bigs. Marquez pitched to similar prominence, with his final 3.77 ERA telling the tale of his first-half struggles and second half dominance. In the season’s final 14 starts for Marquez, he pitched his way to a 2.61 ERA and 12 strikeouts per nine innings, a mark that if strung out over the season’s entirety would’ve ranked fourth in the majors, just behind Justin Verlander (12.2). Altogether, a rotation that boasted their fourth-lowest ERA in franchise history (4.33) is set to return. 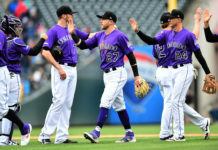 If Gray can bounce back after a suboptimal showing last year, with Tyler Andersen and Chad Bettis or Jeff Hoffman alongside, the Rockies’ rotation will likely get even better. Of note: The Rockies, sans Bettis, have the entire rotation under contract through at least the next two years. 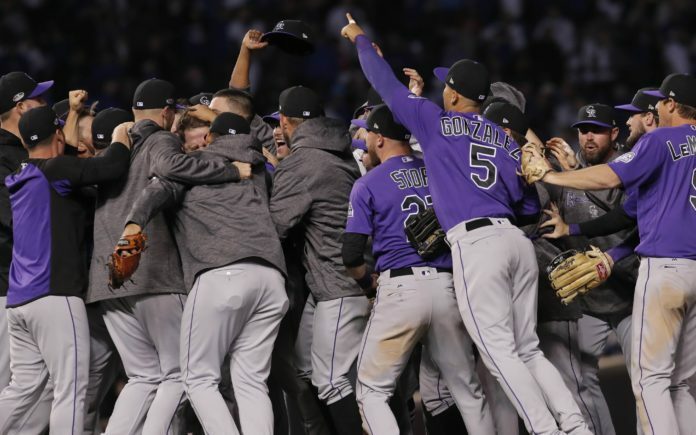 The biggest mystery for the Rockies next season will be the status of their bullpen. Though throttling their spending up, paying big bucks for their back end with the additions of Bryan Shaw and Wade Davis last year, the Rockies’ biggest relief came in the form of Adam Ottavino. With the latter set to depart via free agency, the Rockies back end has more questions than answers heading into next season. 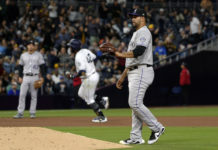 As of now, the Rockies will trot out Davis once again to be their highly-paid closer, with Jake Magee, Shaw and Mike Dunn likely set to vie for the setup role. Outside of the foursome, the Rockies have question marks in both Chris Rusin and Scott Oberg. Rusin, after returning from injury last year, looked like a different pitcher than the year prior. While he posted a 2.65 ERA across 60 appearances in 2016, Rusin spiraled to a 6.09 ERA last season in only 49 appearances. The biggest issue for the Rockies long reliever was his increased walk rate. After only walking 2.0 batters per nine in 2016, his rate ballooned to 4.3 last year. If Rusin can return to form, the Rockies will possess one of the league’s best long relief arms. If not, the onus will be placed on Oberg. Oberg, prior to a breakout last season, was an afterthought by the organization. While compiling an ERA above 4.94 in each of his previous three seasons, last year’s 2.45 mark came as a surprise. As far as expectations go, it would be foolhardy for the club to expect last season to be the rule, rather than the exception. However, if Oberg can continue his run that included a dominant stint in the NL Wild Card matchup with the Clubs that saw him toss 1.1 innings with four-consecutive strikeouts, the club has a chance to improve in the pen. The addition of a fully healthy offseason and a resurgence from Rusin would only further the club’s efforts, setting them up to vastly improve over last year’s pen, even with the loss of Ottavino. Though the front office appears to be set on taking free agency slowly, there are several areas to improve for Jeff Bridich’s club. Eliminating the many questionable variables the Rockies have would be a solid starting point.